With the likes of Yasmani Grandal and Wilson Ramos off the market, the catcher market is starting to dry up. As it stands, the only marquee backstop out there is Miami’s J.T. Realmuto. The Marlins appear intent on trading Realmuto before the start of spring training. Recent reports indicate the Marlins are in talks with six different teams. Let’s take a look at each team’s odds of landing Realmuto via trade. The Astros have been a suitor for Realmuto all offseason. They’ve parted ways with Brian McCann and Evan Gattis, leaving them with an obvious opening behind the plate. Houston’s signing of Michael Brantley could make them a little more likely to part with top prospect Kyle Tucker, something they’ll likely have to do to acquire Realmuto. It’s just a matter of being willing to trade away Tucker. The Marlins have remained reluctant to trade Realmuto within their division, but that hasn’t stopped the Braves from staying in contact with Miami. With McCann and Tyler Flowers, the Braves don’t have a huge need behind the plate. That being said, Realmuto would be a significant upgrade for them. Atlanta’s farm system is also loaded, so they have the prospects to meet Miami’s massive asking price. 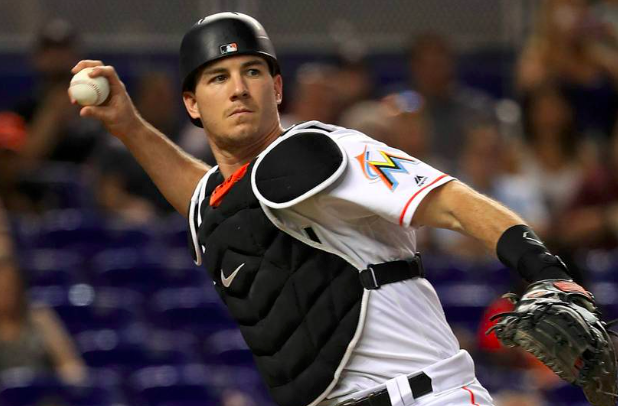 With no chance of Grandal returning, the Dodgers may turn up their pursuit of Realmuto. On the one hand, Los Angeles has some notable catching prospects if they can wait another year or two. On the other hand, the Dodgers are usually aggressive in going after assets that can help them win a World Series. Perhaps more importantly, they have the prospects that would probably persuade the Marlins to send Realmuto to the opposite coast. The Padres have more than kicked the tires on Realmuto, believing that they are close to being ready to compete. San Diego has a pair of young catchers in Austin Hedges and Francisco Mejia, so they don’t have an obvious need behind the plate. However, they could easily part ways with one of them and some of the other prospects from their stacked farm system in order to get an instant upgrade at catcher. After trading for Mike Zunino earlier this offseason, the Rays don’t seem like an obvious choice to trade for Realmuto. However, Tampa Bay has shown a willingness to think outside the box. They could also benefit from more offense from the catcher position than Zunino will likely provide, so it’s not impossible for the Rays to make a move for Realmuto. After their trade with the Dodgers last month, the Reds appear to be gearing up to compete in 2019. Adding Realmuto on top of that could take Cincinnati another step forward. For what it’s worth, the Reds don’t have the same caliber of prospects as some of the other teams in talks with Miami. But after that trade with the Dodgers, the Reds are clearly up to something this winter, so they can’t be counted out. At this point, it seems like these six teams are the only ones in the running for Realmuto. It seems unlikely for a team to come out of nowhere and become a serious contender. However, there is a chance that Miami’s asking price is too high and the Marlins have overplayed their hand. It’s possible but unlikely that Realmuto reports to spring training with the Marlins. At some point in the next six weeks, look for Realmuto to be traded to one of these six teams.